Anthony grew up in the Seattle area, where he has been a lifetime card game player. Becoming obsessed with Android: Netrunner when it was released in 2012, Anthony created and maintains the largest Netrunner fansite and forum, www.stimhack.com. 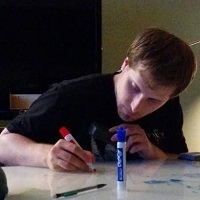 Anthony conceptualized Slay the Spire, leads the design effort, and handles all the boring business stuff for Mega Crit Games.